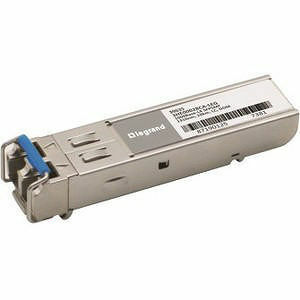 Legrand's 3HE00028CA-LEG Small Form Factor Pluggable (SFP) transceivers are compatible with the Small Form Factor Pluggable Multi-Sourcing Agreement (MSA). The SFP transceivers are high performance, cost effective modules supporting dual data-rate of 1.25Gbps/1.06Gbps and 10km transmission distance with SMF. ESD to the Electrical PINs: compatible with MIL-STD-883 Method 3015. ESD to the Duplex LC Receptacle: compatible with IEC 61000-4-2. Immunity compatible with IEC 61000-4-3. EMI compatible with FCC Part 15 Class B EN55022 Class B (CISPR 22B) VCCI Class B.
Laser Eye Safety compatible with FDA 21CFR 1040.10 and 1040.11 EN60950, EN (IEC) 60825-1,2. RoHs compliant with 2002/95/EC 4.1&4.2 2005/747/EC.